Tags: Building a recording studio, Recording newbie guide. 1.) CLP-295GP Yamaha Clavinova digital piano. 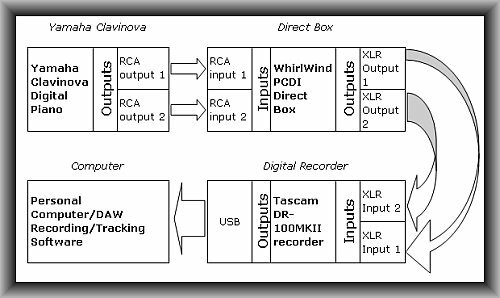 The recording concept is simple; first connect the piano RCA outputs to a digital recorder line inputs. Final processing (editing, mixing, etc) will need files to be transferred to a computer with DAW software (e.g. Reaper). After completing the DAW session such as mixing and mastering, it can be burned into to a CD. Now he is asking recommendations as to what types and brands of preamps to buy. Do you think a preamp is really needed in this case? The very basic function of the preamp is to take a microphone or instrument level signal input (read more about this topic here) and boost it line levels. It’s important to examine the nature of the outputs and signals involved before you can decide whether a preamp is highly necessary. There is only one set of analog outputs on this instrument and that is using the AUX out that consists of 2 RCA jacks. These are line, unbalanced outputs. 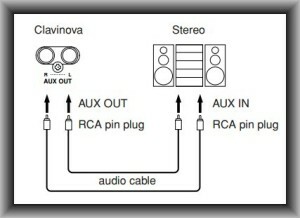 The manual recommends connecting using an RCA to RCA cable from connecting the instrument to a stereo recorder. But this is not the case if you are recording to a digital recorder requiring balanced inputs. RCA is carrying unbalanced signals and could be susceptible to noise and interference. This is a common source of noise if you are recording using unbalanced outputs. This is not to say that recording unbalanced should be entirely avoided but if you want the capture the cleanest sound as possible from your instrument, you need to record using balanced inputs and audio outputs. According to the manual, LINE 1 is used when you are recording from balanced external audio sources. 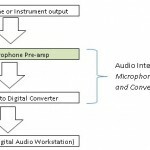 MIC mode is used when you are connecting a MIC level signal to the digital recorder (not necessarily coming from a microphone). It is also worth noting that this digital recorder already includes a preamp because it accepts MIC level signals. 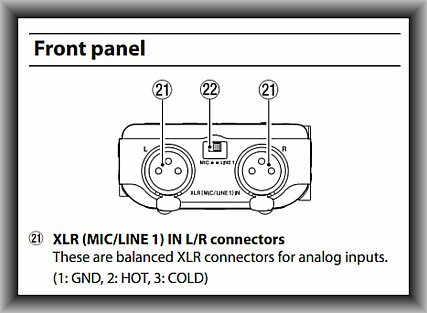 All professional audio recording interfaces and digital recorders today (as long as they accept microphone XLR balanced inputs) are equipped with a built-in preamp. Therefore, buying an external preamp unit is redundant in this case. It is always desirable to have the cleanest sound recording of the musical instrument. One of the gears that could help is using a direct box. 2.) Preserve the original sound of the instrument. Also using RCA to XLR ready-made adapter cables won’t help because it does not do anything to condition/prepare the signals or matched the impedance to the digital recorder inputs. You really need a direct box to make this conversion correctly and as clean as possible. 1.) Turn off the digital piano as well as the digital recorder. Do not yet connect the computer to your digital recorder. 2.) 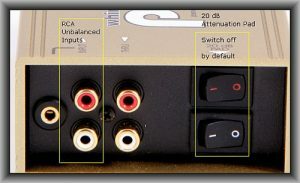 Connect the RCA outputs of the digital piano to RCA inputs of the direct box. There are lots of direct box to choose. The important requirement is that it accepts RCA unbalanced connectors as input and provides balanced-XLR outputs. 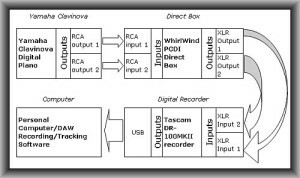 Whirlwind PCDI Direct Box is an example. This is a passive direct box which does not need any external power to operate. Switch off the pad switch (defaults at O position). You can tweak this later on if necessary.